Our utensils cannot contain themselves any longer. We have tons of spatulas, spoons, skimmers, spatulas, tongs, and more. Because it's so convenient to have utensils out and accessible while cooking, we have them in an antique stoneware crock and IKEA stainless steel utensil holder. Post-registry shopping at Crate and Barrel, we now have more items that would benefit from being neatly organized: sushi mats and a baster. Our new skimmer displaced our potato masher so it's also in search of a new home. It's obviously time for another container. But what type of container should we get? Stoneware or stainless steel? 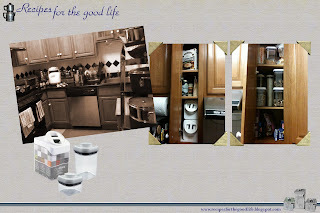 How do you store/organize your kitchen utensils? Before we start searching, we need to set a couple of requirements. 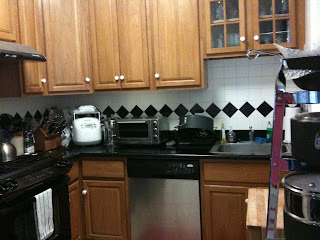 Our kitchen has wood cabinets stained a honey brown with black granite countertops and a mix of black and stainless appliances (photo of our kitchen). What we chose needs to be complementary with this color scheme. The only space on our counter where these utensils can live is next to our countertop oven (photo of how our countertop is currently organized). With the limited space, a metal container could potentially end up being hot to the touch. Of our current containers the crock won't fit, but the IKEA holder would fit perfectly. It's dimensions are 4 3/4" in diameter and 7 1/8" in height. Finally, I'd prefer to get something that's been gently used. As I waited for the water for the coffee to boil (and the coffee to steep), I headed to Etsy. 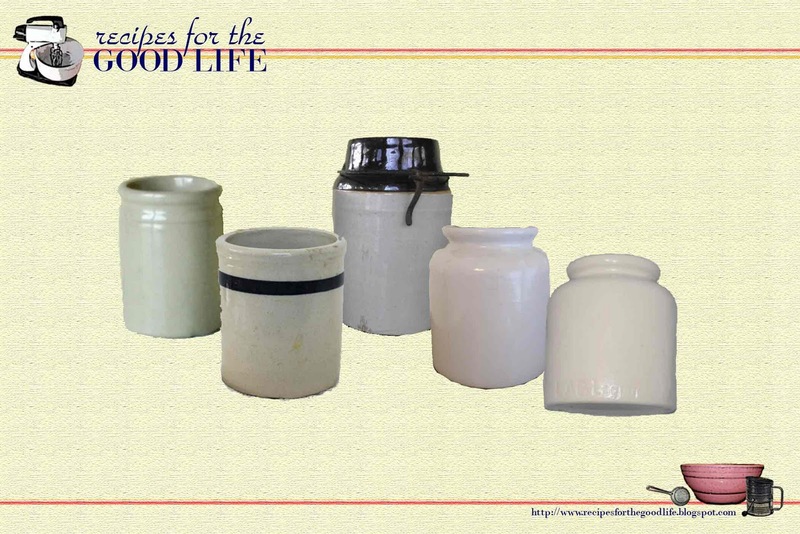 After three searches ("stoneware pot," "utensil jar," and "crock") and about 15 minutes, I had a few options that met our requirements. Where to Get the Look: 3" diameter, 4.5" tall crock from Vintage Junky Style, $8 + $6.10 shipping; 4 1/2" diameter, 5" tall crock from Bailiwick Vintage, $10 + $10.50 shipping; 4 1/4" diameter with 3 1/2" opening, 6 1/2" tall crock from Vintage Variables, $15 + $8.50 shipping; 4" diameter with 2 1/4" opening, 4 1/2" tall crock from Overlook, $8 + $8.50 shipping; Just under 3 1/2" wide mouth, 4 1/2" tall jar from Humming Among Treasures, $6 + $6 shipping. I would use a stoneware crock. I have mine in a 2 gallon Minnesota Stoneware Crock. It makes it simple to clean up when liquid flys out of the pan. I hadn't thought about cleanup but that's a great point. Stoneware wipes clean much easier than other materials. Thanks!